These pumpkin cookies are easy, pumpkiny and spiced with fall spices. Use other spices if you like such as cardamom. 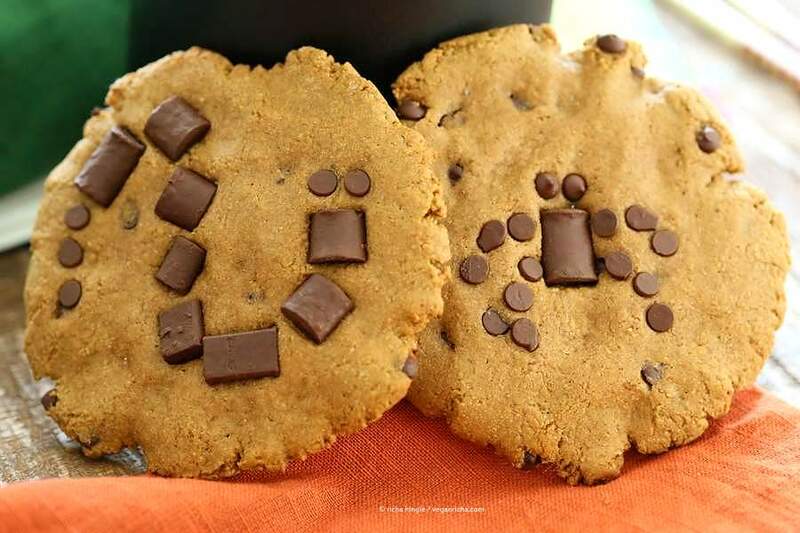 These large cookies are also a great canvas for some halloween-y ideas. Make the dough. 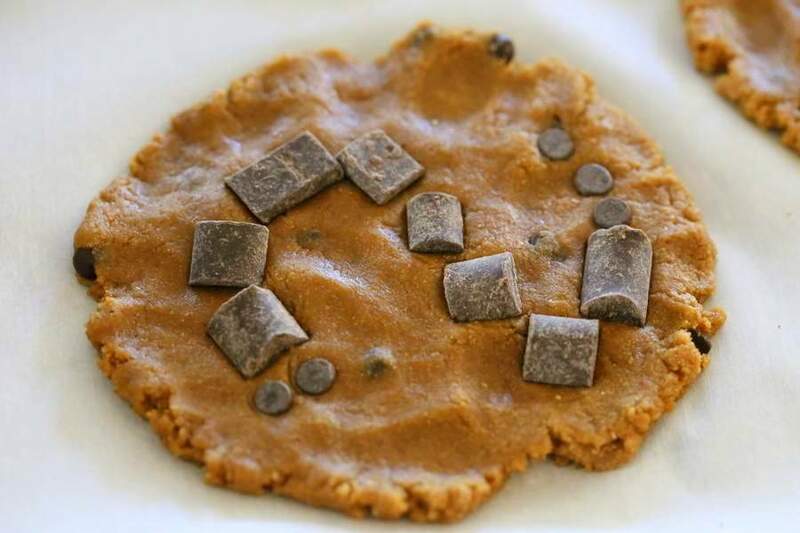 Chill, shape into large cookies, press chocolate chips and chunks in. Bake and done. I am having a ton of trouble concentrating on writing this post today 🙂 too many things on my mind! Pumpkin cookies can easily end up too cakey. To keep them less so, chill the dough, press the dough to make thin cookies, and let the cookies sit for a while after baking. Preferably chill for a few hours. 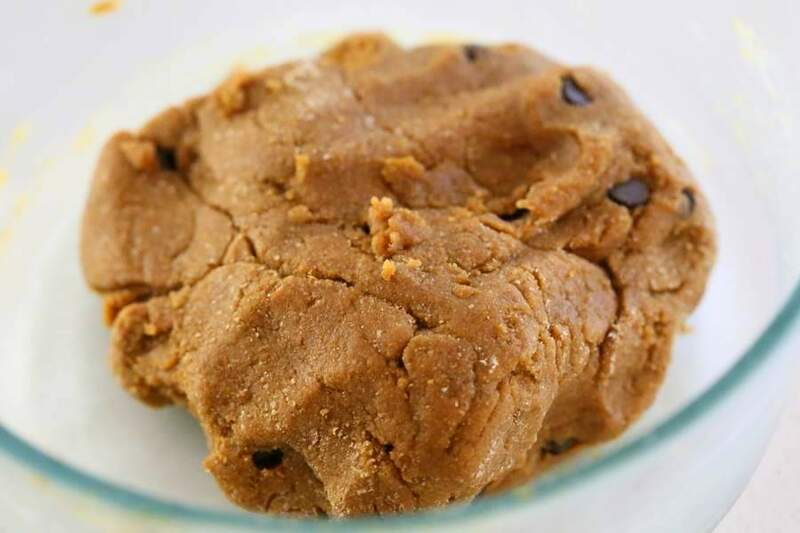 The cookies settle and get chewy. The spices used also get stronger with time. Falafel Witch fingers. No sugar! Make the dough. Chill for half an hour. 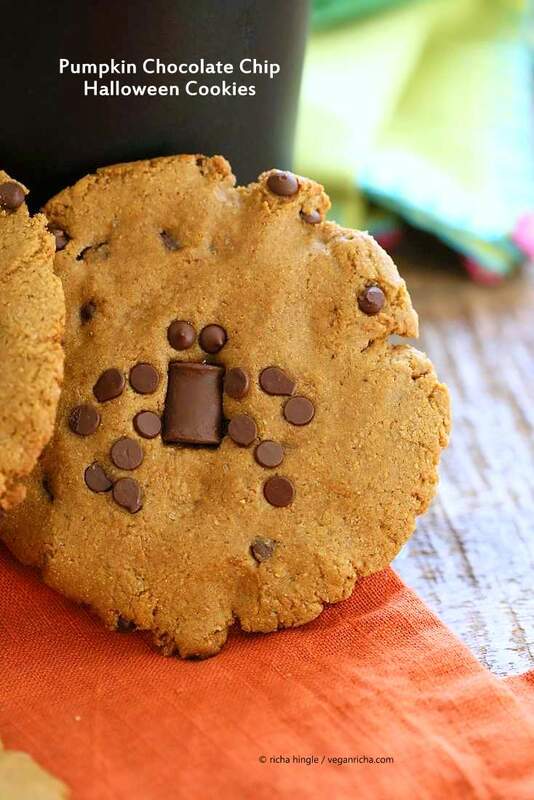 Press the cookies into flat discs. Press chocolate chips and chunks on top. Make your halloween shapes or not. Bake for 14 minutes. Cool completely. Chill for best results. 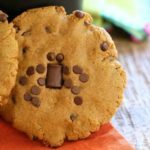 Vegan pumpkin chocolate chip cookies for halloween! In a bowl, mix all the wet ingredients until well combined. In another bowl, whisk all the dry ingredients. Add dry to wet and make a soft dough. if the dough is too sticky, add a tbsp or so more flour and mix in. Add 2 Tbsp mini chocolate chips and mix in. 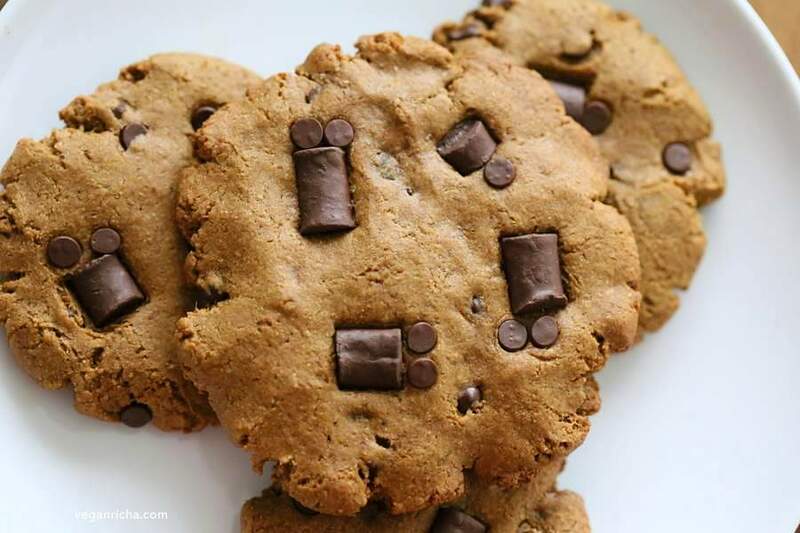 * For regular cookies where you dont plan to press in chocolate on the cookies later, mix in 1/4 cup chocolate chips. Take the dough and divide it into equal balls, Make flat balls and place on parchment lined baking sheet. Press the ball to make a thin cookie. 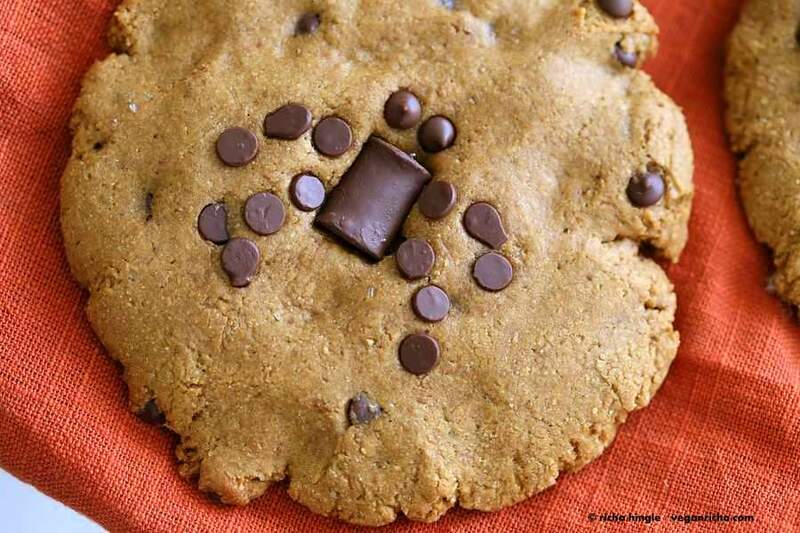 Press chocolate chunks or chips into the shaped cookies to make desired insects, skull, pumpkin etc shapes. Bake for 13 to 15 minutes. The center will be somewhat soft but should be dry and not doughy. Cool the cookies for 15 minutes, then remove from the baking sheet. Cool completely and refrigerate for an hour before serving. I’m making these! Thanks! ???? Thanks again Richa for a great recipe! what flours do you have? 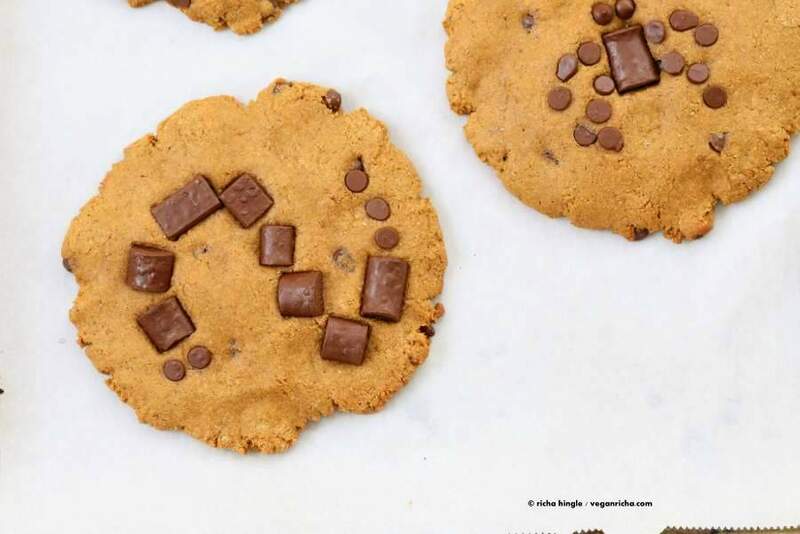 have you baked with quinoa flour before? it has a peculiar flavor. 🙂 you can use 1/2 cup quinoa flour, 1/4 cup almond flour and 2 to 3 Tbsp starch. Yummmm! I need to make these ASAP! I can’t wait to try these. Pumpkin AND chocolate, how divine! Thanks for sharing. So yummy! 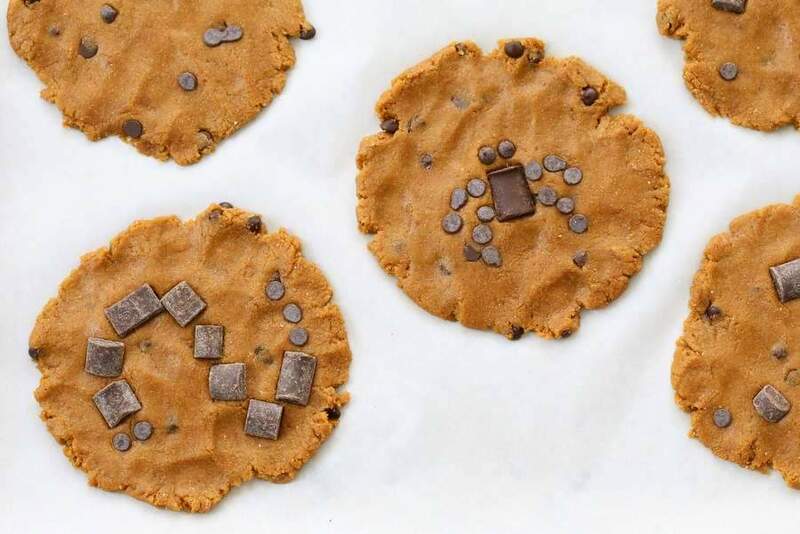 These cookies look like perfect chocolate tortillas! I have to try them!